Complete your virtual pilot’s controller setup and take flight simulation reality to the next level with the Pro Flight Rudder Pedals. Control the rudder and toe brakes of your aircraft with your feet - just like real pilots. Adjustable, smooth action gives you optimum control and realism, and brings you even closer to the experience of flying a real aircraft. Purchase today and you can return it in the original condition through Monday, May 27, 2019 ! See our return policy. Pros: Seem durable and well designed. Price not too high. Review: They work as intended. I just wish they were designed to be used more like real pedals where you slide your feet up to use the toe brakes, not where you place your whole foot on the pedal. More like the Cessna pedals that Saitek/Logitech used to make, they are more realistic. Pros: Pedals are requisites for flight **simulation**; the product is plug and play. Review: As a means to train a pilot to coordinate his feet with his hand(s), pedals are indispensable. As such, these pedals are far better than yoke paddles and light-years ahead of adverse-yawing your way through the virtual atmosphere. I've owned the Saitek PFRP for more than five years. The reason for only two stars, however, is that contrary to many of the reviews here, my Saitek PFRP is flimsy and does not stand up to even moderate home use. It is, approximately, a toy. My central problem is that at the limit of movement**, the system has a tendency to jump its internal guide tracks. Repeated full extension has resulted in the tracking ridges molded into the interior of the case to actually break entirely such that any use of the pedals near full extension requires a disassembly of the case for realignment. No home repair was possible, so I finally installed a couple of bolts to block pedal movement into this zone at the expense of full rudder deflection. For the price, however, I'm pretty disappointed. I'd like to think to one could do better. ** Full rudder defection comes into play in slips (to landing, for example), certain aerobatic maneuvers and, that when faced with imminent virtual death, you just need to yank and bank. Review: Yes very much so. Use them every day. I am retired and it keeps me out of my wife's way.😊 I wish I had bought the sooner as it makes you feel like I am flying. Review: Built solid and good for the price. Review: Setup was fairly easy. The movement of the pedals is different from the real thing but not hard to get adapted to it. The sensitivity adjustment is difficult and still is not satisfactory -- the virtual airplane is difficult to track on takeoff and landing, tending to quickly wander off center and it's very easy to overcorrect. All that said, given it's a sim and not the real thing it's fun to use and I think will get easier to control with practice. Review: The performance of these are worth more than this price. Very accurate and the pedals rotation can be hardened or loosened. Cons: Design should be more like Cessna toe pedals where you slide your feet upward to use toe brakes. Was this review helpful to you? Yes No 2 Other people found this review helpful. Cons: Poor construction does not stand up to even moderate home use. Was this review helpful to you? Yes No 3 Other people found this review helpful. Cons: Wish I had them sooner. 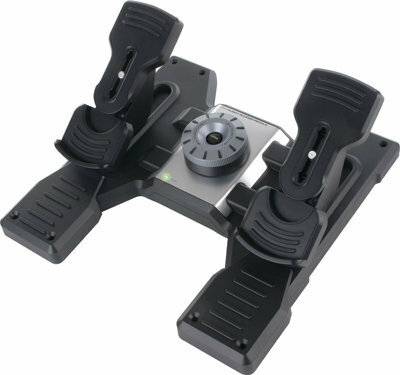 Q: Can rudder Pedals be used (as well as other Saitek Gear) with Windows 8.1? A: Yes, these are compatible with Windows 8.1 and the other Saitek products. Built with the same high end components you find in CH Products, the CH Eclipse brings value added functions to compliment all your favorite sims. Precision. Realism. Control. The Saitek Pro Flight Yoke System is engineered to meet the exacting needs of true flight simulation enthusiasts.